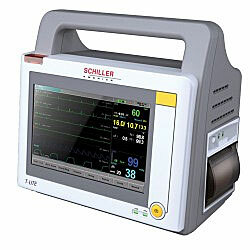 The Schiller T-Lite Touch Screen Patient Monitor offers basic patient monitoring with a simple interface, all in an ultra-portable, battery-powered package. With 2 or 3 waveforms displayed, graphical and tabular trending, audible and visible alarms, and built-in printer, the T-Lite offers professional features in a small package. The T-Lite features ECG, ETCO2, NIBP, SPO2, and respiration monitoring. An adaptable touchscreen interface makes the T-Lite intuitive, and its 8 inch TFT LCD balances size and visibility. A combination of large numerical values and high-contrast waveforms make for a complete overview of patient status at a glance. 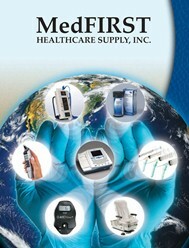 The patient monitor includes an adult blood pressure cuff with hose, SPO2 sensor and cable, operator's manual, and power cable. Additional cuff sizes, mounting solutions, and printer paper are also available (see ACCESSORIES tab for details). The T-Lite Vital Signs Monitor is proudly made in the USA.